Concrete is pulverized with the mixture of limestone, clay, and iron ore powder in proportion. At this time the mixture is called raw materials. Followed by calcination, the general temperature is of 1450 degrees. After calcination, the product is called clinker. Then according to a certain percentage, the clinker is mixed with gypsum. The mixture is then grinded to the required fineness. Here you have produced concrete. This is only a general description. Here you can learn about the whole process in detail. (1) Crushing. With comparatively larger particles and higher hardness, crushing the lime stone to required fineness after mining is of relatively important consequence among crushing all those raw materials. According to the raw materials’ different particles and hardness, there are several suitable concrete crusher which can be used in the crushing. (2) Pre-homogenization of raw materials. Pre-equalization technology is to use the scientific stacker reclaimer technology to realize the initial homogenization of raw materials, so that raw materials yard has the functions of storage and homogenization at the same time during the process of the retention of raw materials. It takes at least 3 ton materials (including raw stuff, fuel, clinker, compound and gypsum) to produce 1 ton Portland concrete during the production. 5. The burning of concrete clinker. 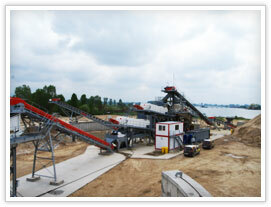 Grinding is the last process of concrete produce and also is the most current consuming working procedure. There are many grinding machines suitable to grind the concrete clinker, such as ball mill, vertical mill, high pressure suspension grinding machine and Raymond mill, etc.